Born in Addis Ababa, Ethiopia in 1970, and now resident in New York, Julie Mehretu is among the most highly regarded artists working today. 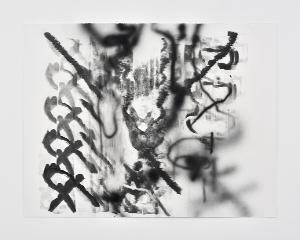 A recent painting by the artist, Ghosthymn, was included in the exhibition Actions. The image of the world can be different, which marked the re-opening of Kettle’s Yard in 2018. For this exhibition, Mehretu has made a new installation of richly layered drawings and monotypes, extending her dynamic exploration of the potential of drawing and mark making which are fundamental to her artistic practice. Inspired by current world issues, her personal biography, and the history of abstraction, Mehretu’s powerful works interrogate the present with urgency and lyricism.